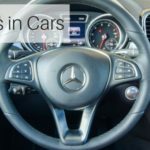 Infotainment systems are gaining in popularity and the technology is becoming increasingly more advanced. These clever additions for the modern car driver are turning your vehicle into a moving computer or a mobile, mobile phone!..... See what we did there? Simply, it's an integrated system that offers a host of information and entertainment at your fingertips from the dashboard of your car. We've all adopted the smartphone into our lives and now we wonder how we ever lived without Google at our fingertips! Infotainment systems are the same. Once you've experienced everything one of these systems brings to your driving experience then you will wonder how you ever managed without it.